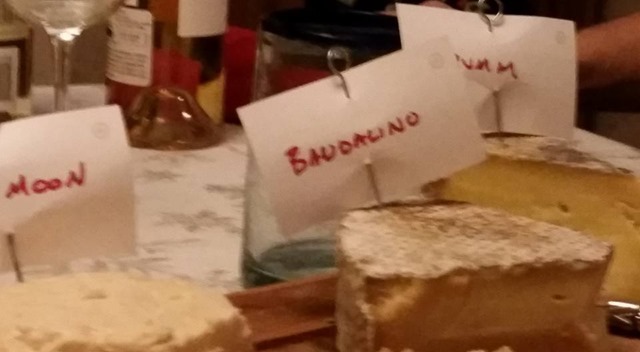 OK, I promised I’d write this up, and it has taken me a while, but here it is. 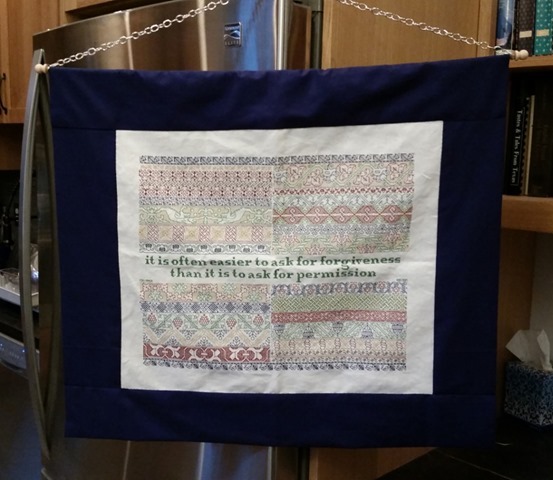 My thought here was to create a quick and easy way to finish off a hanging sampler, using a method that did no harm to the stitched piece, that was inexpensive to do, and required no special equipment or components that can’t be found in most crafts stores. Why “no harm?” Because many inexpensive framing solutions do exactly that. They place fabric under stress, encase it in moisture-trapping glass, matt it or line it with acidic materials that over time discolor or eat away at the ground cloth, or place the fabric up against wood or metal that can corrode or mark the cloth. 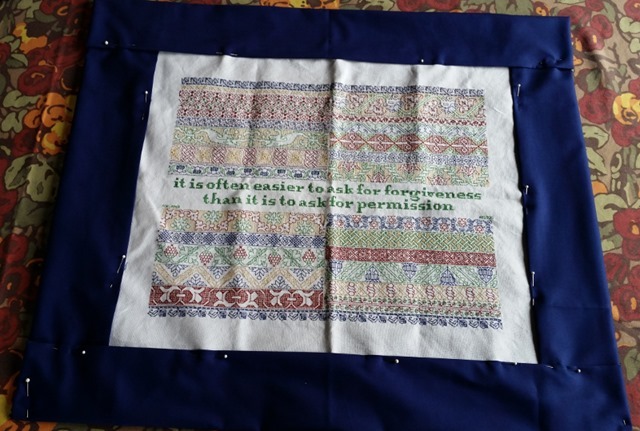 This solution is far from ideal, but it manages tension to avoid stretch or strain in hanging, isolates the stitched piece from any wooden or metal framing elements, can be quickly picked out without harm to the original work, and is very inexpensive. 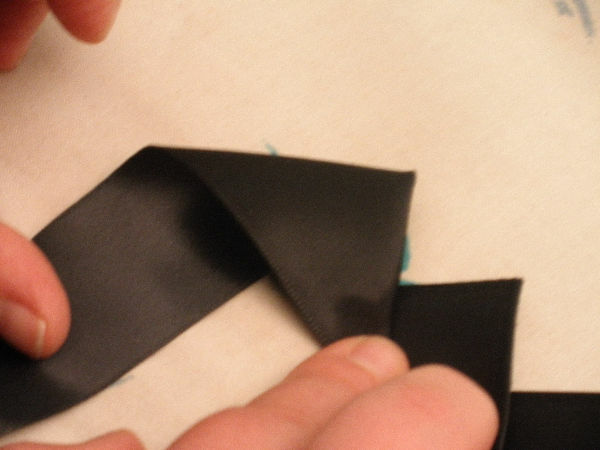 In all cases, a larger piece of backing fabric has been used to encapsulate the stitched item. 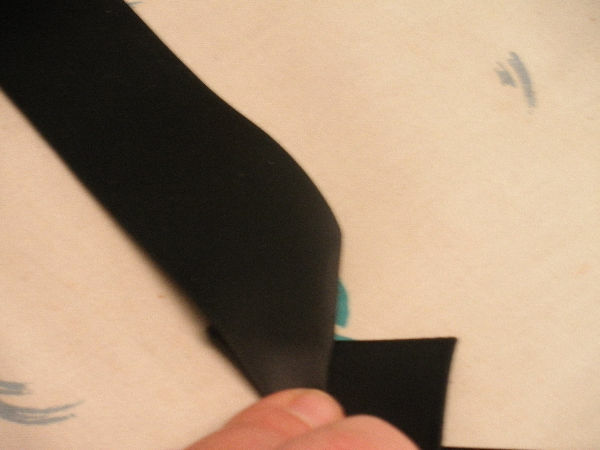 The hanging bar (wood or metal) and bottom-weighting only touches the backing fabric. All are totally sewn by hand – no machine stitching. Note that you don’t need to have actually stitched a sampler to do this. 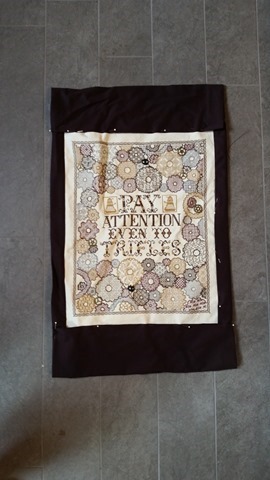 It would be useful to finish off a decorative tea-towel, heirloom doily, cloth map, or small pieced patchwork as a hanging, or (for my SCA pals) to mount a painted or printed banner for display. Backing fabric. I used plain old quilting cotton. Any fabric will do, although for the “no harm” bit, I suggest washed cotton or linen rather than polyester or other synthetic. Size needed calcs below. Plain old cotton sewing thread that matches the backing fabric. A hand-sewing needle – a sharp with a small eye is recommended. A metal bar or wooden dowel for a top support (fancy finials are optional, but can be handy for fixing hanging strings or chains in place so that the hanging mechanism doesn’t compress the top edge of the hanging). The aforementioned hanging string or chain. 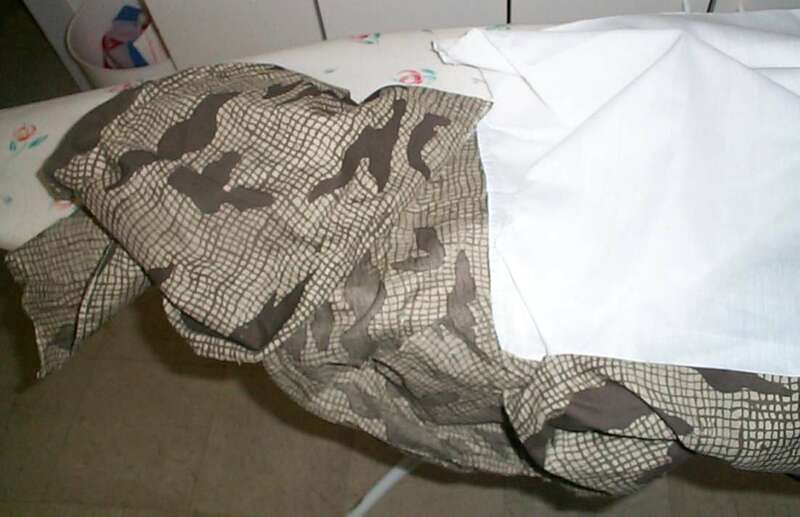 An iron and ironing surface. Optional weights for the bottom edge. I have used a length of brass chain, threaded onto an old ribbon, and small zinc drapery weights (small bars of zinc enclosed in a synthetic fabric envelope). These are sold in packs of two or six, in the curtain-notions department. Avoid the lead ones just on principle – the world does not need more free-range lead. In a pinch, coins sewn into little fabric pockets will do. If you are using drapery weights or coins, you only need two. I found the backing fabric, dowel, wooden finials, the drapery weights, and the chain all in my local JoAnne’s fabric/crafts store. First, decide how you want to frame your piece. A large area top and bottom, with narrower areas on the sides? Equal frame all the way around? 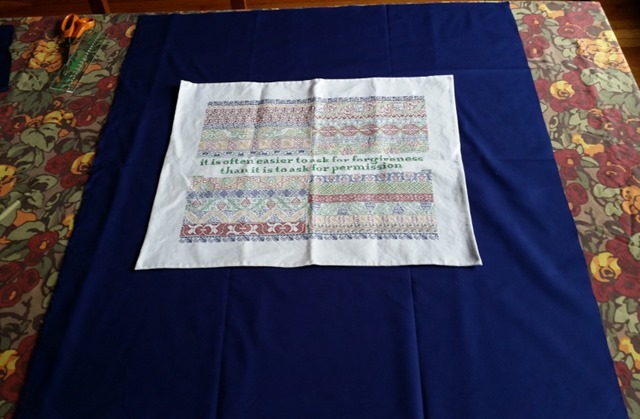 The general size will inform your fabric purchase, although one yard of most quilting fabrics will be MORE than enough for all but the very largest samplers. For the Permissions sampler, I decided I wanted a blue frame about 3.5 inches all the way around, and to preserve about 1 inch of unworked ground between the stitching and the edging I put pins in my sampler to mark that distance from my stitching, and measured the “to be shown” dimensions of my piece. About a half inch of my sampler, all the way around, will be hidden inside the backing. The next thing to do is iron in the 0.5” hem all the way around. 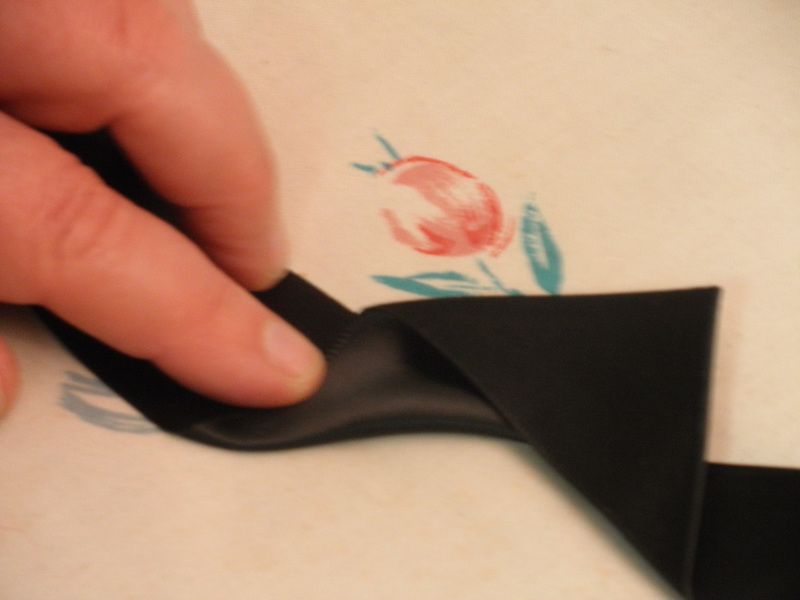 Note that the “right side” of the backing fabric (such as it is, is DOWN). I chose to iron in mitered corners for tasty neatness, but that’s optional, and there are a ton of video tutorials on doing that. Once the stitched piece was correctly positioned. 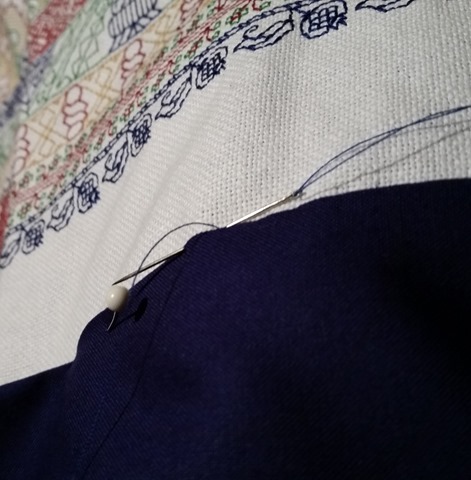 I folded the left and right edges in, carefully aligning them (measuring the distance from my embroidery), and finger pressing them down and pinning. 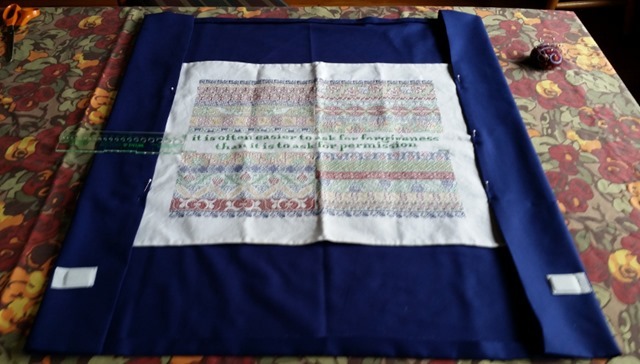 Because I stitched on even weave, I was able to use the count of my ground fabric for **perfect** alignment without having to mark the fold-to line on my sampler. 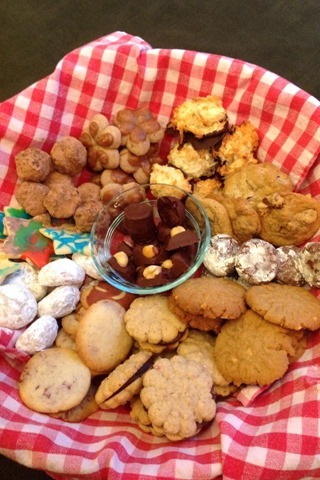 Those two little white tabs? 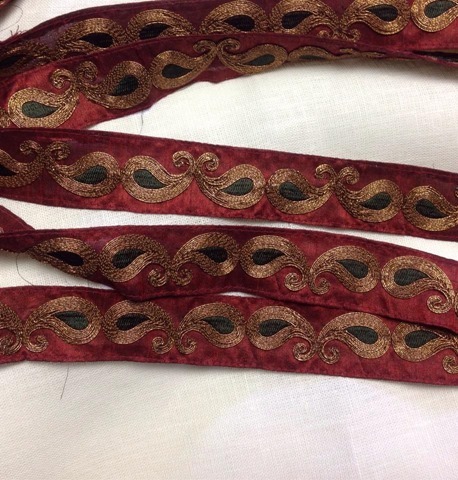 Those are the drapery weights – note that they have little tab ends that are handy for stitching. That’s where they will go, encapsulated in the edging/backing, far away from the stitching. Next I folded in the top and bottom and pinned them, too. 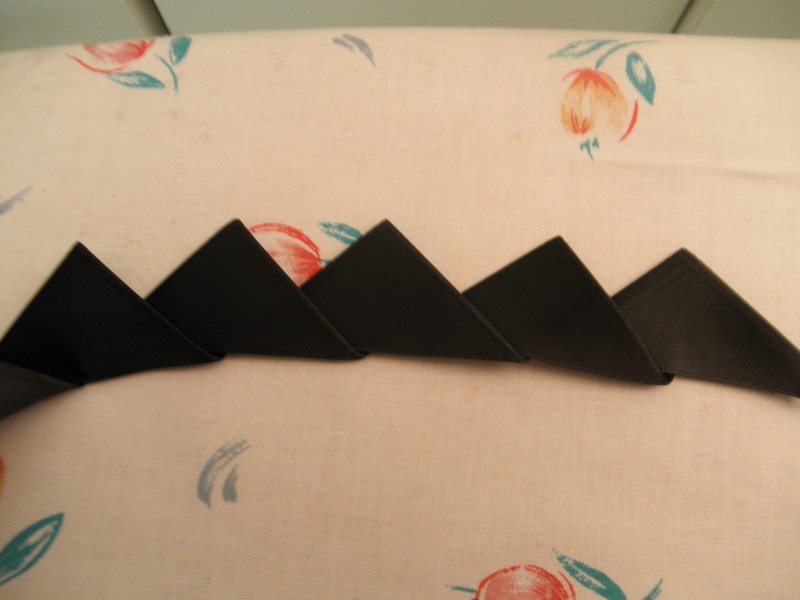 Once all edges were pinned, I lightly touched up the folds with my iron, to make them slightly crisper. Then I slid those drapery weights in and pinned them into place. Here’s the thing, ready for hand stitching. 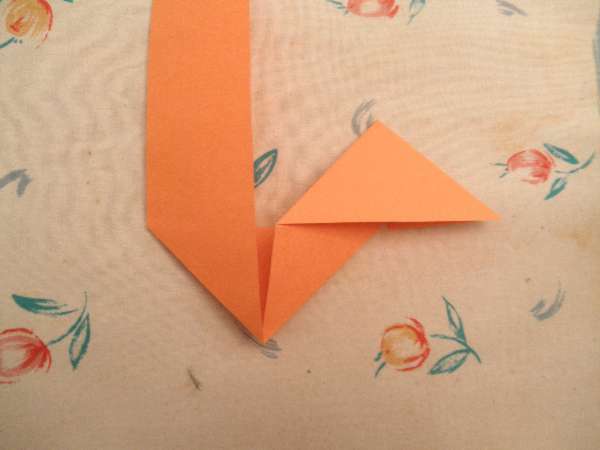 You’ll notice that there are simple lapped corners – I didn’t miter them. 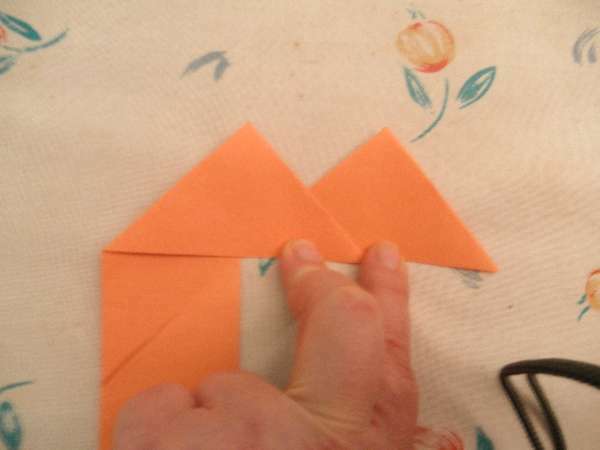 By doing this I can use the flap-over on the top as my hanging pocket. I do not need to engineer a separate hanging method for attaching the bar or dowel. Starting at the lower corner where the bottom and side flaps meet, and working first completely around the stitched sampler part, ignoring the flapped areas at the corners, I worked a simple hand appliqué stitch, catching a tiny bit of the edging, passing through the ground cloth but not the ultimate backing – at a diagonal, ready to make my next stitch. Here’s a tutorial on the appliqué stitch. Note that I used the even weave’s threads to keep my hem nice and straight. 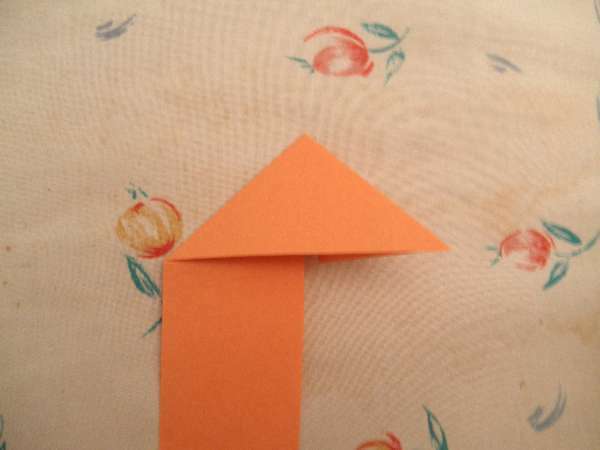 I worked the top two corners similarly, but instead of working all the way down to the tip of the corner as I whipped the front to the back, I stopped about 0.5” from the top on both the left and the right. This left an opening through which I could pass my dowel. A small bit of finesse was needed to thread it through (I used another scrap of dowel to nose the hem allowance out of the way on the inside). To make the hanging stick, I used a 1/4 inch dowel. I probably should have used a metal rod or a thicker dowel, but that’s what they had in the store. I bought a little pack of finials, and ended up having to shave down the ends of my dowel just a tiny bit so that they fit into the holes on the finials. I also bought a length of inexpensive craft chain, intended for chunky necklaces, with links large enough to fit around the dowel. I cut the dowel to the width of my finished piece, plus about 0.5”. Using a regular office stapler, I stapled the chain to my dowel, about a quarter of an inch from the end. I dotted the inside of the first finial with wood glue and forced it onto the dowel and over a bit of the staple, so that the chain was butted up against it. Then I threaded the dowel through the top of the hanging, squishing up the hanging a bit to keep it away from my working end, I stapled the other end of the chain to the dowel, then forced on the second finial. It came with a top sheet, a fitted bottom sheet, a comforter and a pillowcase. And for some reason – a bed skirt. 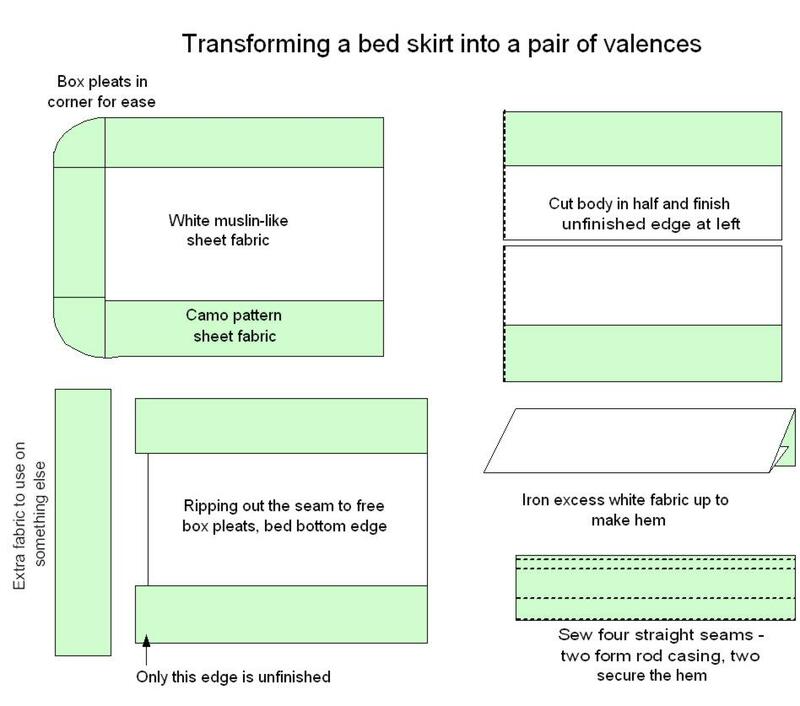 To those who don’t suckle at the breast of Martha Stewart, a bed skirt is a somewhat prissy patterned dust ruffle that lies between the mattress and box spring on most beds, with the fashion fabric curtaining off the under-bed area from general view. Far be it from me to question the wisdom of the marketers who thought that someone favoring camouflage patterns might use and appreciate such a thing. In any case, her bed is a high platform with built-in drawers underneath and a bed skirt is irrelevant. Still, the skirt came with the set, and I abhor waste, so together Elder Daughter and I decided to remake it into a pair of narrow valences for the windows in her room. It’s taken this long to start the project because my ancient Elna sewing machine has been up on blocks awaiting repairs. The machine has now been overhauled and I am no longer able to endure the puppy looks and pleading, so I’ve begun. We have no ideas on what to do with the excised bit from the former foot. Various pillow and stuffed animal suggestions have been floated. I also considered (then discarded as too fiddly) the idea of using some of it to make curtain tabs rather than a simple rod casing. I think I’ll take this opportunity to introduce Elder Daughter to Ancient Elna. 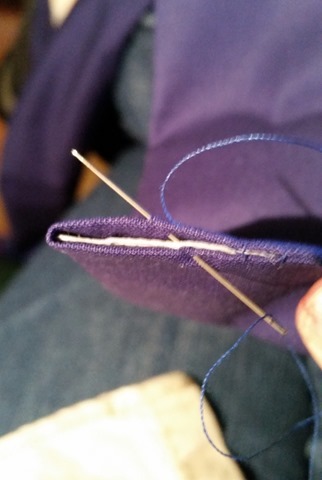 Long straight seams are easy and sewing is a life skill. More on this as we progress. Life continues to intrude on my knitting time. Besides the regular flock of work-related obligations last week, I was surprised by Smaller Daughter. Thursday morning, rummaging in her backpack looking for her lunchbox, I found a notice for her elementary school’s Colonial Day. It’s an interactive festival sort of day, but one that requires all of the kids to dress in some attempt at a historical costume. (To be fair, I had heard about it long ago but forgotten.) So with a costume needed within 7 days, but my being away on a business trip starting Monday, my Memorial day weekend activities now included a close huddle with my ancient Elna sewing machine. I wanted to make something relatively early – closer to first encounter than the Revolutionary War so that target child had a chance of wearing her outfit again. I pelted over to the fabric store during lunch hour on Friday and picked up a couple of remnants – 2.75 yards of a soft green twill whatever (plus matching thread), and one yard of a linen-look in white, all for about $10.00. The price was right. 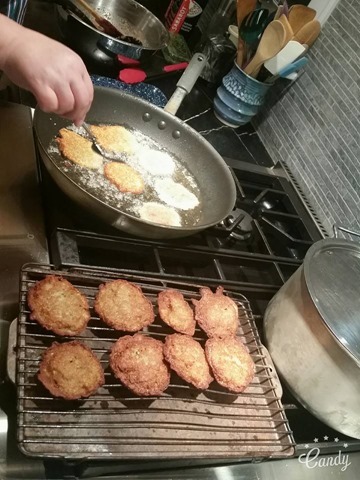 Then I came home and thought about what to make. I had already made her a puffy white pirate shirt that could double as a chemise, and I have a small white cap and coif set. A skirt, a bodice of some sort, plus an apron would be enough. 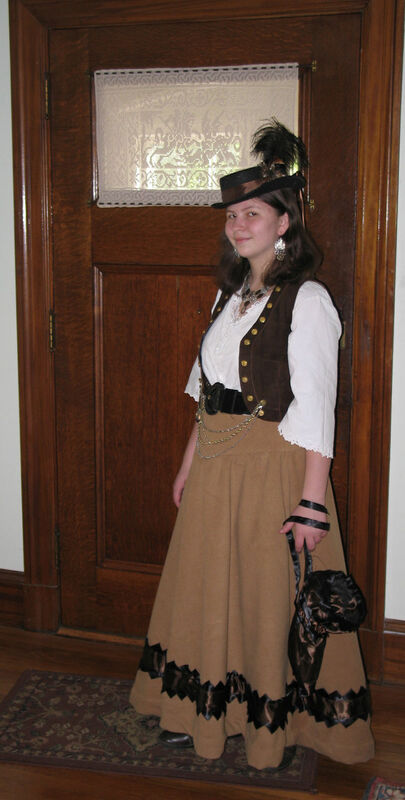 Drawstring skirts are easy enough, but the bodice part was tougher. Front lacing (instead of buttons) would do. Thankfully the topography of an 8-year old is easier to accommodate than that of a post-pubescent. I took measurements and drafted out a simple tab-bottom bodice with short sleeves. To make it substantial enough, I cut two of everything, so that the whole thing is self-lined. 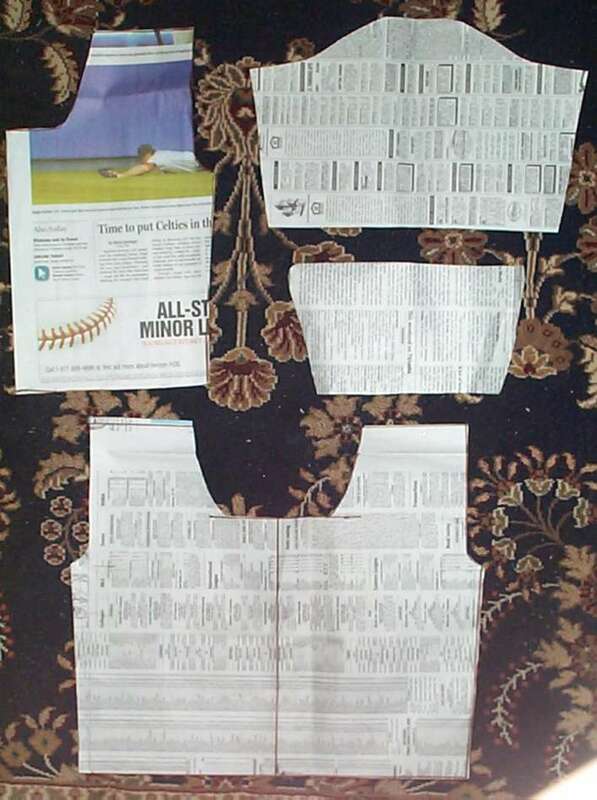 Here are the resulting pattern pieces, snipped from Red Sox coverage in the Boston Globe, plus all of the pieces sewn and assembled into the final bodice/jacket. Things went pretty smoothly. 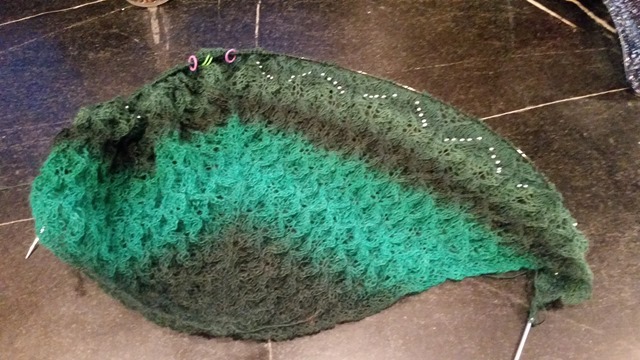 I started by sewing the shoulder seams of the outer and inner shells, then uniting them along the neckline by sewing them together up the center front closure and around the neck. 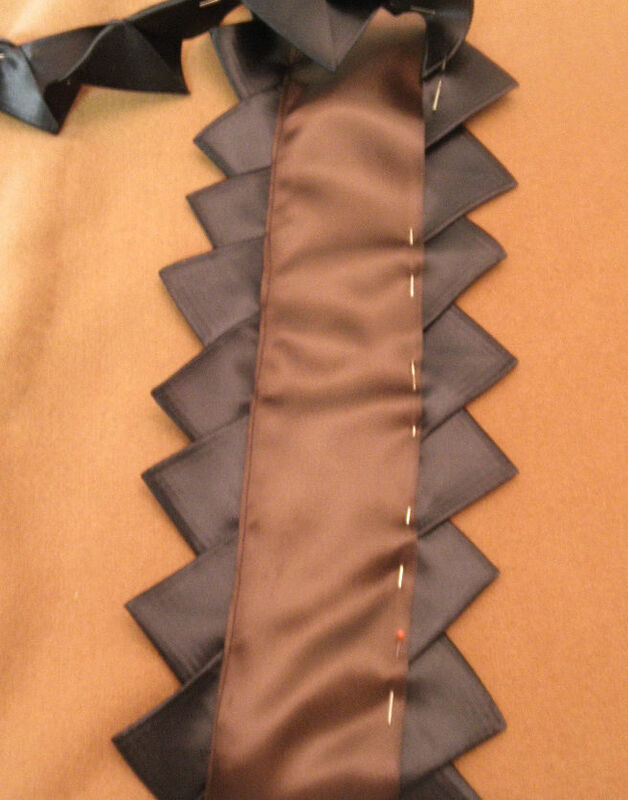 Then I sewed the side seams of the inner and outer shell, inverted the inner lining and pressed everything flat. 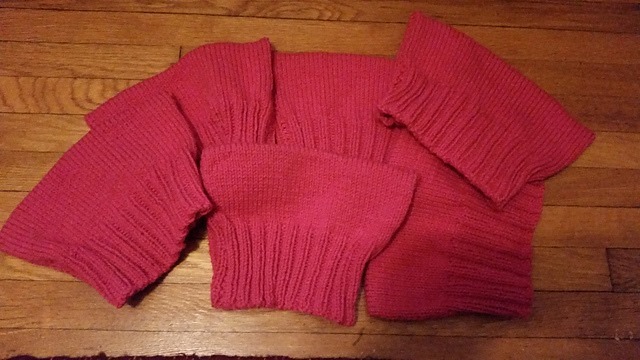 The sleeves went together quickly, too. 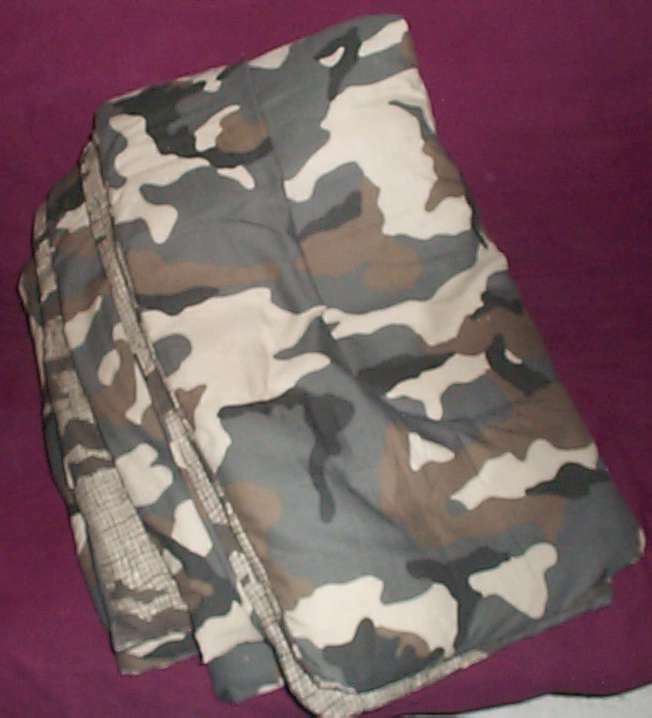 I sewed the inner and outer sleeve along the bottom edge, then did the underarm seam for the united unit all at once. I inverted the inner linings and pressed my sleeves. Once the sleeves were together, I set them in the bodice. 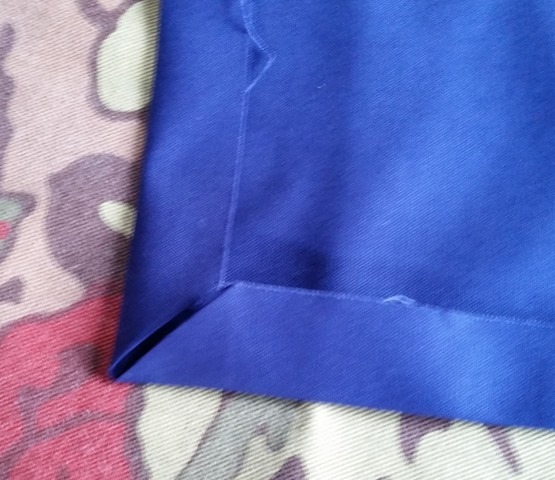 Then I sewed together the inner and outer side of the tabs (that odd shaped piece below the sleeve) – making one for each quadrant of the garment. I turned them inside out and seamed them to the bottom edge of the outer shell. Last, I folded the inner shell’s lower edge down to cover the raw edges of the tabs, and hemstitched it down by hand (too may layers for my sewing machine to cope with). Since I didn’t have much time, I didn’t go with a zillion buttons or hand-made lacing holes. 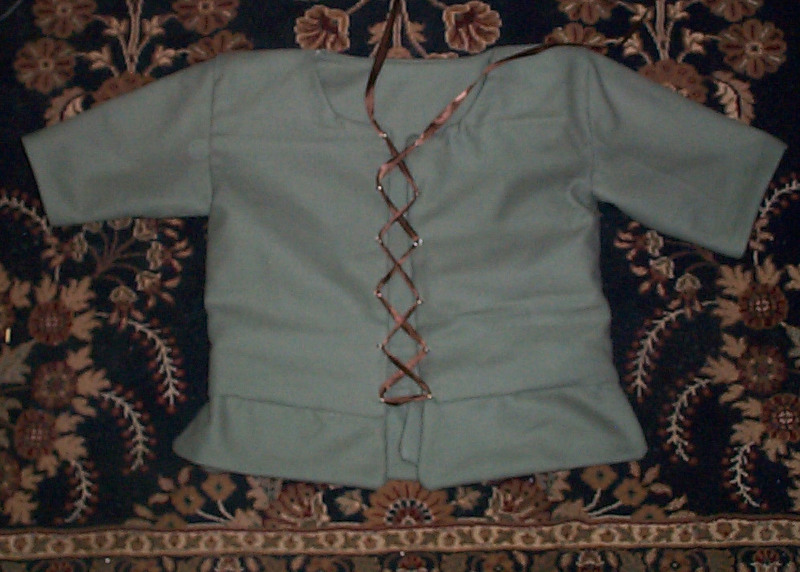 There’s little if any tension on a little girl’s bodice, so I didn’t bother with reinforcing the lacing edge. I opted for the not very historical but really quick stage option – small rings sewn along the lacing edge to hold the fastening ribbon. Sacrificing a dozen split rings, formerly in use as place markers for lace knitting, I stitched them down by hand. The apron was also easy. I cut two strips off the top of my yardage and lapping them end to end, pressed the seam lines for the apron’s band and strings. 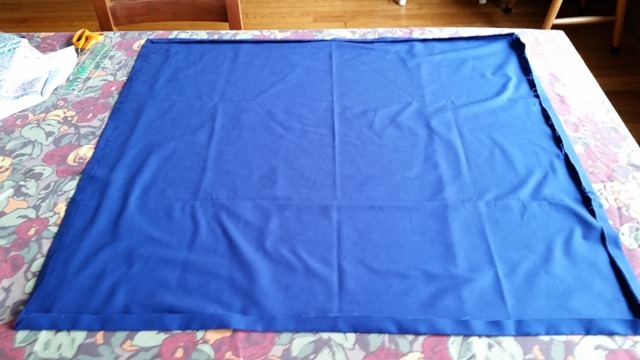 Then I sewed the edges of the remaining piece (again doing it double-sided for additional body), gathered the raw edge and encapsulated it in the center of the apron. Time from taking the first measurements to final hemming – approximately 16 hours of work. 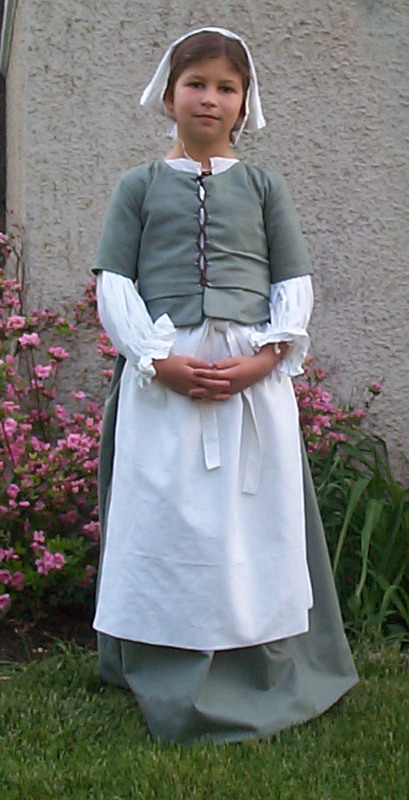 Here’s the end result: one semi-historical kid-suit, inspiration from the 1620s. And yes, Target Child did help, learning how to use the sewing machine and working it for long, straight seams, tracing the pattern pieces with chalk, and doing a bit of the hand-work. Knitting? 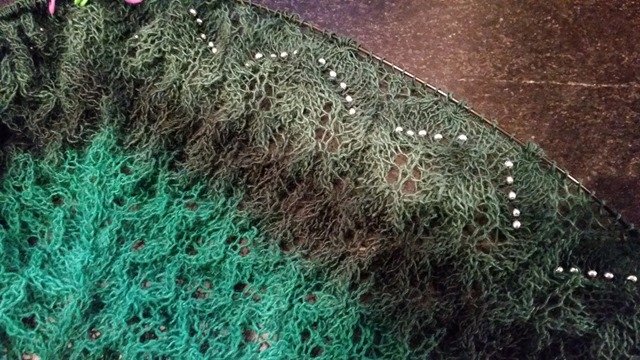 I finished my vintage lace scarf. Blocking was postponed on account of Colonial Day.